Are you always searching for that treat, toy or gadget that will help get more attention from your kitty? I am. I would love to spoil my cat Stinky with treats galore, if he only wasn’t so supercilious to every thing I give him. When I saw Pounce Cat Treats in my local supermarket, I thought “why not? It’s only $1.49, let’s try it”. 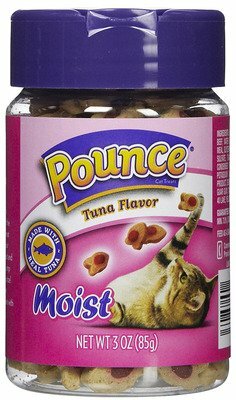 Knowing that Pounce is made by Del Monte Pet Products, I thought they surely must know what cats like. Well, they sure didn’t have Stinky as a taste-test panelist. Stinky took one finicky sniff and walked away. Why are cats so finicky with food and treats? No one knows for sure, but their sense of smell is incredible. I read that a cat has a smell and taste capabilities that are far superior to we humans. Their olfactory organ allows them to actually taste something just by smelling it. This protects the cat from bad chemicals, spoiled food, and helps them identify their kittens. Now, I have another theory why Stinky my cat is so finicky towards Pounce Cat Treats. I figure it is because Pounce tastes like Play-Doh. Yes, I tasted one of the precious heart shaped morsels. Yes, it tasted like Play-Doh with essence of bland chicken. Champ my dog liked Pounce Cat Treats. In fact I am training him to be ambidextrous and shake with his right paw, not just his left. If you’d like to try Pounce Cat Treats, nearly every supermarket carries the product. The price is affordable, so do try it.